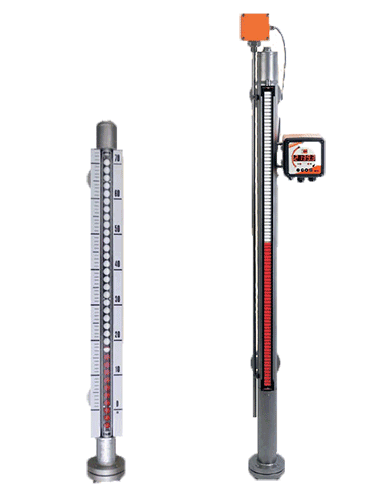 Kobold® type NBK bypass level indicators are used for continuous measurement, display, and monitoring of liquid levels. The bypass tube is attached to the side wall of the tank. They are commonly used for storage tanks, tanks on ships, agitator vessels, and water tanks. Kobold® type DMH magnetic inductive flow meters are designed to measure and monitor the volume flow rate of liquids, pulps, pastes, and other electronically conductive media without loss of pressure and can be used in rugged environments. The measuring transducer can be connected to the sensor directly or mounted remotely. Pressure, temperature, density, and viscosity do not affect the volume measurement. Large solids and gas bubbles should be avoided. The DMH offers a variety of lining, electrode, and process connection options.